The parents of a missing 6-month-old will be charged in connection with the infant's murder. CULVER CITY, Calif. (KABC) -- The parents of a missing 6-month-old baby will be charged in connection with the infant's murder, Culver City police told Eyewitness News on Monday. Jacsun Manson's body has never been found, but his mother confessed to detectives that she knew the baby was not alive. Authorities said they believe Jacsun's parents, Adam Manson and Kiana Williams, killed Jacsun and discarded the child's body in a dumpster somewhere near the Crenshaw Mall in Los Angeles. Investigators on Monday searched the El Sobrante Landfill in Corona, where they believe Jacsun's body may have ended up. It's sure to be a painstakingly slow process trying to find the remains of a 6-month-old boy inside a landfill that processes 70,000 tons of trash every week. 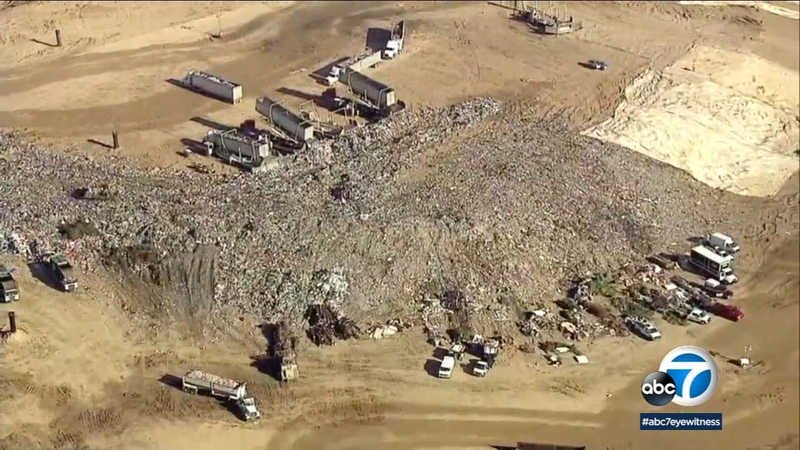 "We have over 20 personnel at the landfill right now," said Culver City police Lt. Troy Dunlap. Investigators searched the El Sobrante Landfill in Corona, where they believe Jacson's body may have ended up. Jacsun was reported missing on Jan. 25, but he was last seen on New Year's Eve with the parents in a PT Cruiser. Police say that car ended up being stolen from a homeless transitional housing facility in Culver City, where they were living. Jacsun's parents were arrested a few days later, but there was no sign of the baby. "They stole the girl's car that lived here, they had a meth pipe in their room full of drugs, they were pretty crazy," said one person familiar with the situation. Police said the two have not been helpful in giving up information to help investigators find the baby. "They should have never (been given back) the child. They are two recovering addicts," Adam Manson's sister Aegina Manson said. "A lot of it doesn't make sense. There's a lot of lies." She said she believed that for awhile, the baby was with a friend. Aegina Manson said she talked to her brother shortly before the boy went missing. She said he was in tears, admitting he just couldn't care for his child. She agreed to care for the boy, but he never called back to make those arrangements. Nine years ago, the Fontana Police Department found the remains of a teenager in the same Corona landfill. In that case, it took three months to find the remains - and they started searching just days after she went missing. Monday's search of the landfill turned up empty. Now, authorities are putting together a plan as to how to move forward because the trash from the time they need is already buried, and they will need heavy machinery to dig. Manson and Williams are expected to be charged later this week with second-degree murder. If you have any information about Jacsun's case, you're urged to contact the Culver City Police Department. During business hours, contact Detective Raya at (310) 253-6318, and after business hours, please contact the watch commander at (310) 253-6202.